Aaron Bradford, 29, of Santa Cruz, Ca. and Margaret Gregory, 31, of Redlands, Ca. won the Men’s and Women’s Open classes of the Scott Enduro Cup presented by Go Pro on Sunday in Sun Valley. The two-day Super Enduro mountain bike race was the showcase event of the fourth annual Smith Optics Ride Sun Valley Bike Festival. There were 122 finishers, 102 men and 20 women. An official stop on North American Enduro Tour, the Scott Enduro Cup offered five timed stages, with the fastest two-day combined times on the leaderboards for men and women determining the champions. Those champions were last year’s USA Cycling Cyclo-Cross National men’s singlespeed runner-up Bradford (1.00:49) with Gregory (1.08:59) leading the women. Bradford captured the 39-racer Men’s Open class barely 12 seconds ahead of second-place biker Kyle Warner, 21, of Chico, Ca. (1.01:01). Ketchum’s Adam Greene, 33, nailed the hammer-down descents to land third place (1.02:07) to go with his eighth-place Master Men 30-34 finish in the 2013 USA Cycling Marathon Nationals at Sun Valley. Two young up-and-comers, Mason Bond (1.02:17) and Cody Kelley (1.02:33), were hot on the heels of the seasoned pros to secure fourth and fifth places. 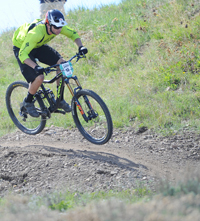 Bond, 20, of Cedar Ridge, Ca., was riding for Nevada Union High School when he won the Junior class of the 2011 USA Cycling Mountain Bike Cross-Country Nationals on Baldy. Kelley, 20, of Riverton, Utah, is coming off a Pro Men’s victory in April at the Sea Otter Classic mountain bike dual slalom in Monterey, Ca. In Women’s Open, Gregory (1.08:59) dominated the field nearly three minutes ahead of the competition. But Smith Optics Endurance Promotions Manager Mallory Burda of Ketchum (1.11:46) executed the steep sections of the course with impeccable downhill technique to step up into second place. Close behind was Beth Roberts, 38, of Moab, Utah at 1.12:55 ahead of fourth-place Ileana Anderson, 26, of Swannanoa, N.C. (1.13:48) and fifth-place Madi McQueen, 26, (1.15:42). Just missing the top five was Hailey’s Simone Kastner, 26, in sixth place (1.17:31). The Open category podium winners received $2,500 total in prize money divided evenly between men and women. The first-place riders in the amateur categories received gear from sponsors. Among the amateur winners were locals Tyler Chandler, 26, in Amateur Men 19-29 with a 1.07:15 time and Matt McNeal, 34, in Amateur Men 30-39 at 1.04:14. McCall’s Heather Thiry, 37, captured Amateur Women by 46 seconds with a 1.18:40 clocking. Thiry was the recent women’s runner-up at the USA Cycling 24-Hour Mountain Bike Nationals Ultra-Endurance race in New Mexico. She was also second in singlespeed at the Sea Otter Classic. Stosh Bankston, 43, of Olympic Valley, Ca. won Amateur Men 40-plus in 1.04:31. Park City’s Evan DeGray, 17, took Junior Men by over two minutes at 1.07:37. Riders and spectators also had the chance to enter nightly raffles which raised over $1,800 for the Wood River Bicycle Coalition. Raffle prizes were provided by Scott Sports, GoPro, ENVE Composites, Borealis Fat Bikes, Yakima, Club Ride Apparel, Vittoria, SRAM, GEAX, and Ride Sun Valley. 1—Aaron Bradford, 29, 1.00:49. 2—Kyle Warner, 21, 1.01:01. 3—Adam Greene, 33, 1.02:07. 4—Mason Bond, 20, 1.02:17. 5—Cody Kelley, 20, 1.02:33. 6—Greg Randolph, 41, 1.02:45. 7—Clint Claassen, 30, 1.03:24. 8—Dylan Cirulis, 31, 1.03:30. 9—Matt Erbentraut, 18, 1.03:56. 10—Parker DeGray, 20, 1.04:01. 11—Peter Ostroski, 24, 1.04:03. 12—Randy Schrauder, 42, 1.04:15. 13—Jason Boeckmann, 32, 1.04:28. 14—Dylan Crane, 18, 1.04:32. 15—Bradley Pastir, 30, 1.04:47. 16—Logan Whitehead, 30, 1.05:10. 17—Dien Toussaint, 35, 1.05:12. 18—Nate Lewis, 26, 1.05:20. 19—Craig Harvey, 36, 1.05:31. 20—Burke Saunders, 25, 1.05:46. 21—Henry Horrocks, 41, 1.05:47. 22—Kevin Boyer, 24, 1.05:50. 23—Eric Chizum, 34, 1.06:00. 24—Justin Fernandes, 28, 1.06:02. 25—David Harrison, 50, 1.06:49. 26—Todd Byle, 44, 1.07:28. 27—Mark Longfield, 35, 1.08:01. 28—Joe Weede, 30, 1.08:37. 29—Malachi Artice, 22, 1.08:44. 30—Travis Fitzgerald, 33, 1.08:55. 31—Ali Goulet, 40, 1.09:02. 32—Brian Hapgood, 37, 1.09:29. 33—Jason Young, 37, 1.10:31. 34—Tom Harvey, 39, 1.11:08. 35—Juan Grande Johnston, 43, 1.11:23. 36—Steve Goodman, 27, 1.12:46. 37—Riley Hewes, 26, 1.13:34. 38—Cory Smith, 40, 1.14:02. 39—Mike Wieser, 30, 1.16:44. 1—Margaret Gregory, 31, 1.08:59. 2—Mallory Burda, 26, 1.11:46. 3—Beth Roberts, 38, 1.12:55. 4—Ileana Anderson, 26, 1.13:48. 5—Madi McQueen, 26, 1.15:43. 6—Simone Kastner, 26, 1.17:31. 7—Brenda Moczygemba, 29, 1.20:45. 8—Bernie Nelson, 23, 1.21:44. 9—Lizzy Adams, 30, 1.28:56. 10—Erica Roman, 23, 1.31:35. 11—Emily Clemens, 28, 1.49:32. 1—Tyler Chandler, 26, 1.07:15. 2—Forrest Saville, 29, 1.08:03. 3—Pat Hurley, 25, 1.08:14. 4—Andrew Putt, 23, 1.10:08. 5—Jake Hampton, 29, 1.10:17. 6—Elliot Doe, 24, 1.10:44. 7—Ryan Mauser, 27, 1.11:07. 8—Tyler Elkanger, 23, 1.11:19. 9—Thomas Duggan, 22, 1.11:34. 10—Kyle Schuppan, 28, 1.11:44. 11—Henry Frank, 28, 1.12:57. 12—Nick Crocker, 21, 1.13:17. 13—Joe Winebrenner, 27, 1.13:47. 14—Jake Covert, 24, 1.13:55. 15—Korey Szapacs, 28, 1.13:59. 16—Brian Shindurling, 27, 1.14:03. 17—Maxx Cohen, 29, 1.15:10. 18—Christian McKenna, 24, 1.19:44. 19—Nate Hoff, 26, 1.20:08. 20—Toby Citret, 27, 1.20:56. 21—Kyler Riggs, 19, 1.24:40. 22—Brian Hollinger, 28, 1.34:35. 1—Matt McNeal, 34, 1.04:14. 2—Eric Patterson, 30, 1.08:22. 3—Steve LeBlanc, 35, 1.10:19. 4—Jake Hollander, 35, 1.12:36. 5—Clay Sammis, 39, 1.13:26. 6—Eugene Fletcher, 39, 1.15:05. 7—Chris Broullire, 31, 1.15:37. 8—Brian Lewis, 31, 1.15:46. 9—Jed Clawson, 30, 1.22:08. 10—Dan Coppola, 32, 1.23:24. 11—Chad Riggs, 37, 1.25:57. 12—Tearle Eide, 34, 1.34:48. 13—Mike Gromer, 33, 1.35:45. 14—Christian Ervin, 37, 1.39:21. 1—Stosh Bankston, 42, 1.04:31. 2—Cary Smith, 45, 1.05:24. 3—Frank Trotter, 42, 1.05:42. 4—Kelly Lee, 51, 1.05:53. 5—Mike Gile, 45, 1.06:02. 6—Todd Smith, 46, 1.06:10. 7—Marc Driver, 47, 1.07:48. 8—Greg Dertorossian, 51, 1.09:55. 9—Klaus Fleischmann, 45, 1.10:59. 10—Craig Parker, 43, 1.11:06. 11—Kyle Paredes, 40, 1.11:48. 12—Mat Gover, 40, 1.12:14. 13—Connell Lloyd, 51, 1.14:44. 14—Chris Booher, 43, 1.14:46. 15—Gary Kyle, 42, 1.20:38. 16—Will Fernyhough, 56, 1.22:10. 17—Jason Hughes, 41, 1.26:16. 18—Scott Desserault, 44, 1.26:45. 19—Robert Blount, 45, 1.32:42. 20—Jon Freckleton, 42, 1.37:16. 1—Heather Thiry, 37, 1.18:40. 2—Cassie Abel, 31, 1.19:26. 3—Melanie Yakemovic, 25, 1.24:47. 4—Emma Maaranen, 37, 1.26:34. 5—Lyndie Saville, 29, 1.26:56. 6—Annelies Ware, 44, 1.32:22. 7—Sarah Torres, 41, 1.45:28. 8—Jessica Wolcott, 44, 1.54:27. 9—Lindsey Johnson, 32, 2.03:30. 1—Evan DeGray, 17, 1.07:37. 2—Duncan Fuller, 16, 1.09:58. 3—Brody Buchwalter, 15, 1.10:59. 4—Blake Deilke, 14, 1.18:23. 5—Spencer Wright, 14, 1.20:55. 6—Isaac Maughan, 13, 1.34:57. 7—Sean Barrett, 16, 1.37:19.